Bitter melon is best when very young. 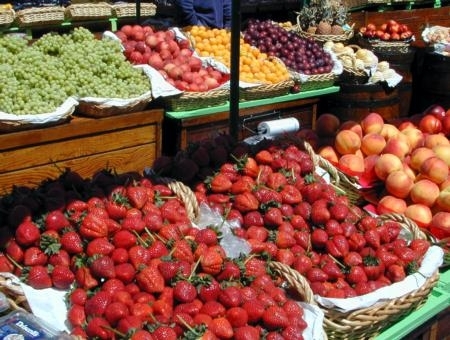 Most Americans gravitate toward the familiar in supermarket produce aisles. But some creative shopping unveils a tremendous diversity of edible vegetables that can turn an ordinary menu into a much more interesting cuisine. At certain roadside stands, at farmers markets that cater to diverse clientele and in small Asian supermarkets, adventurous Californians can buy vegetables like bitter melon, Chinese long beans, opo and luffa. Finding them is the first step, knowing how to prepare them is another matter. UC Cooperative Extension has made these less familiar vegetables more accessible by creating a collection of easy-to-cook and nutritious Southeast Asian vegetable recipes. The recipes were developed by UCCE nutrition educators in Fresno and the statewide UC Expanded Food and Nutrition Education Program team with Richard Molinar, a UCCE advisor in Fresno County. Connie Schneider, director of the UC Youth, Families and Communities Program, and Molinar started by researching the traditional usage of Asian vegetables. They modified some ingredients and procedures in the recipes to simplify preparation and improve the nutritional profile. For the last 18 years, Molinar has worked with small-scale farmers in Fresno County, which boasts the largest concentration of Hmong farmers in the U.S. Fresno County is also home to farmers of other ethnicities from Laos, China and Vietnam. Molinar and his assistant, Michael Yang, have introduced Southeast Asian immigrant farmers to the latest farming technologies, helped them develop plans to ensure the safety of the food they grow, and worked with them to find new marketing opportunities. Many of these farmers have begun growing vegetables common in California, and most have also kept some space on the farm for the vegetables of their homelands. The UCCE educators recognized that the rich culinary traditions of local Southeast Asian immigrants could be adapted and used by people of all cultures to increase their consumption of vegetables. Besides, encouraging consumption of Southeast Asian vegetables adds new marketing opportunities for the farmers. The 12 recipes are printed on cards, each with photos of the fresh vegetable and background information. For example, the recipe card for “bitter melon stir fry” notes that the crinkly skinned vegetable is native to India and is eaten when young and green, as bitterness increases with age. The recipe is accompanied by a photo of the prepared dish and complete nutrition facts per serving. 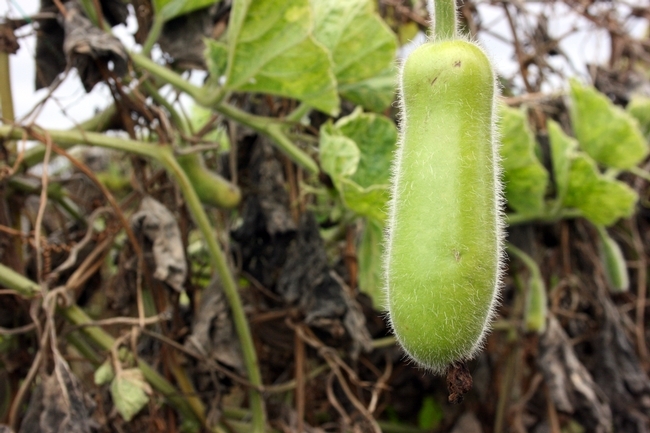 Most people are familiar with luffa after it has dried into a natural scrubby. It is often found near beauty products in stores and purchased to exfoliate the skin. 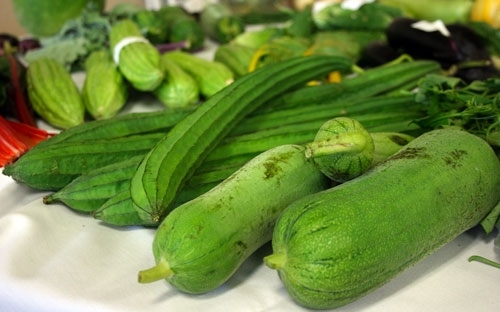 However, the UCCE recipe card for “luffa and prawns” notes that fresh green luffa has a similar but sweeter flavor than zucchini summer squash when stir fried. 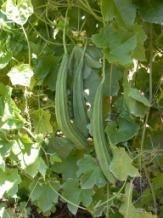 Either the smooth or angled varieties of luffa can be used in the recipe. "I grew up with zucchini," Molinar said, "but I prefer the flavor and texture of angled luffa." Heat olive oil in skillet over medium heat. Sauté onions for about 5 minutes until tender. Add garlic; sauté an additional 2 minutes; mix in pork and cook until no longer pink. Add shrimp; cook about 5 minutes until done. Add tomato, bitter melon, and soy sauce; cook until tender. Heat oil in a wok/pan; add garlic and stir fry for 1 minute. Add luffa; continue to stir fry with prawns until just tender, about 5 minutes. Put down that zucchini! Pick up the ... bittermelon? Welcome to August. Are you tired of summer squash yet? If your dinners have been overflowing with zucchini recently (like mine have), now might be a great time to try new varieties of otherwise familiar vegetables. One of the farm advisors I work with has long touted some varieties of "Asian vegetables" as more flavorful than their traditionally "American" cousins. Here in the U.S., vegetable varieties like these are more likely to be grown by farmers — and sold to customers — who have close ties to Asian immigrant communities. Richard Molinar, UC Cooperative Extension farm advisor for Fresno County, works frequently with Hmong farmers and says that he now prefers Hmong cucumber and Japanese eggplant to the varieties you might find in most California supermarkets. After years of hearing Molinar's claims, I finally had a chance to try some of these new-to-me Asian vegetables during lunch at the Hmong Specialty Crops and Medicinal Herbs conference. 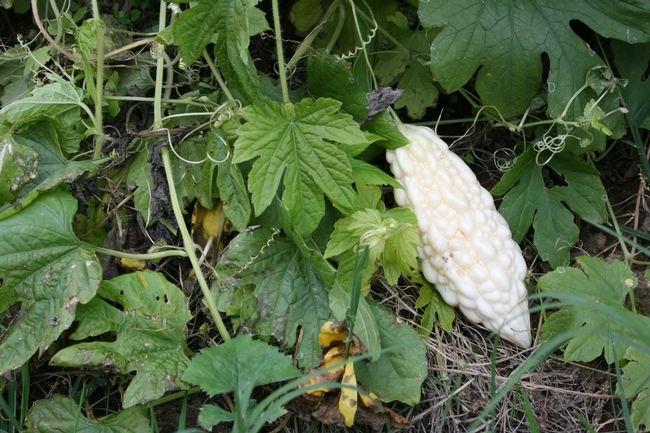 Presenters in the morning talked about crops such as sinqua, luffa (photo above has fresh luffa, in angled and smooth varieties), moqua, snake gourd, bittermelon and donqua — all of which are cucurbits, in the gourd family with other squashes and melons. 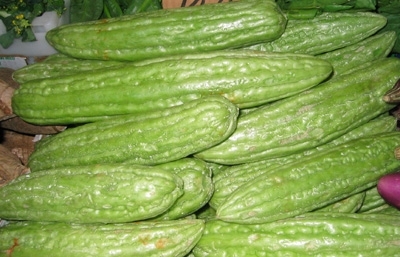 Other Asian vegetables common in some specialty markets include leafy greens and tender shoots from chayote, amaranth, bittermelon, pumpkin, okra leaf, yam leaf, yucca and sour leaf plants. Discussions at the conference focused on these and other specialty crops, including ways to eat them. "Maybe we need a recipe to teach customers how to buy these new crops," said Chukuo Thao, CEO of National Hmong American Farmers, who alternated between English and Hmong while speaking at the conference. 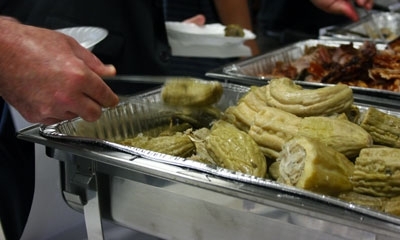 A dish of bittermelon stuffed with turkey and noodles was part of the conference's lunch menu. 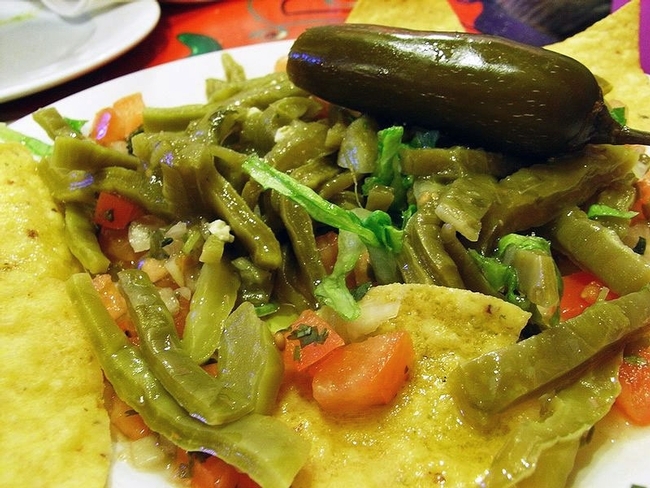 Some of the vegetables and herbs discussed at the conference were highlights of that day's lunch. The menu included a slushy Hmong cucumber drink, purple sticky rice, salsa made with cherry tomatoes, stir-fried mustard greens with pork skin, Hmong herbal chicken soup and steamed bittermelon stuffed with turkey. But how did it taste? The stuffed bittermelon was what I was most looking forward to trying. The dish was delicious and wow, was it bitter! That is one appropriately named vegetable. Speakers at the conference suggested bitterness is frequently associated with medicinal qualities in Hmong cuisine. Not all of the lunch dishes were bitter, of course. The cucumber dish was refreshing and very sweet, a dish with eggplant was spicy, and the mustard greens were salty and pungent. Many of the dishes were also made with lemongrass; Fresno County is where most of the nation's lemongrass comes from, according to Molinar in a recent article from the California Ag Network. Curious about other Asian vegetables? 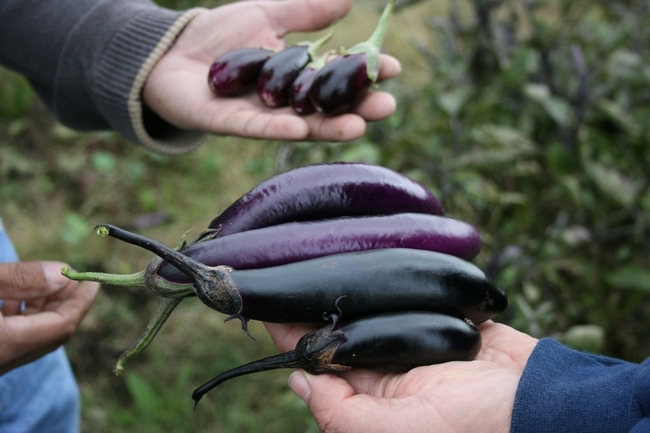 Check out the Small Farm Program's guides to Asian vegetables, along with tips for farmers about how to grow and sell these niche varieties. Question: The Small Farm Program has a lot of information about different vegetable varieties, but I'm still finding new vegetables to try. What are some of your favorite Asian vegetables? P.S. While the conference was my first chance to taste bittermelon, Richard Molinar and Gus Schumacher (former USDA undersecretary) were being honored by Hmong community members for their long-time support of Southeast Asian refugee farmers. 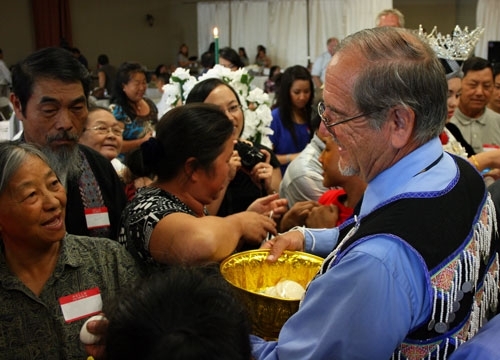 The two men were each given Hmong names in a special ceremony. Audience members tie strings to Molinar's wrists and offer him eggs, cookies and other tokens after he was given a Hmong name.